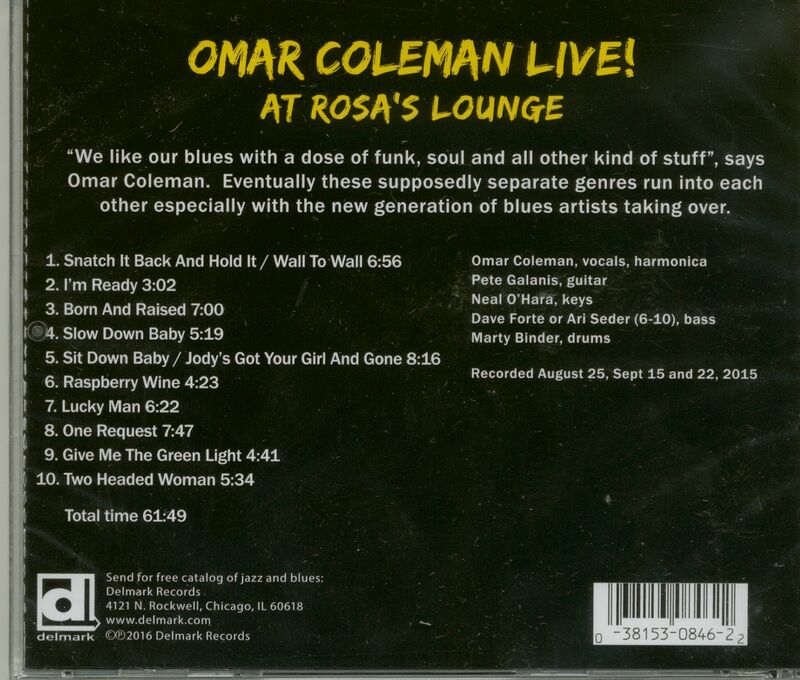 'We like our blues with a dose of funk, soul and all other kind of stuff', says Omar Coleman. Eventually these supposedly separate genres run into each other especially with the new generation of blues artists taking over. 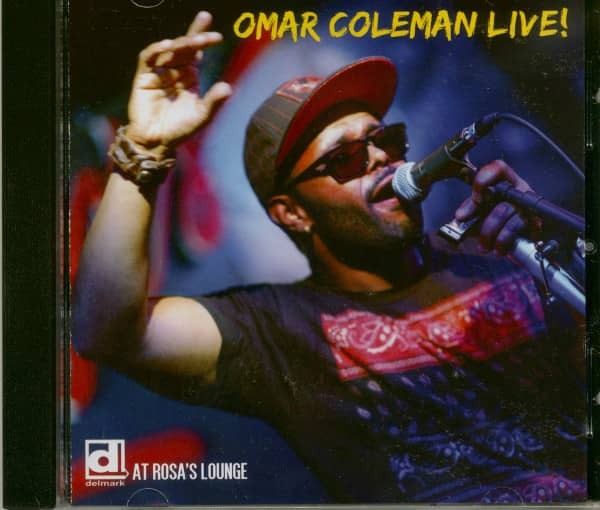 Omar Coleman is a great singer, harmonica player and songwriter. He combines the classic blues sounds of his home city with a more contemporary direction. Omar Coleman - hca,voc, Pete Galanis - gtr, Neal O'Hara - kbds, Dave Forte - bass(1-5, Ari Seder - bass(6-10), Marty Binder - drums. Recorded August 25th and September 15th and 22nd 2015. Omar, who was born in 1973, is a knowledgeable and committed carrier of the Chicago blues tradition: he just insists on carrying that tradition in his own way. One of his seminal exposures to blues harmonica was through the iconoclastic, genre-jumping experimentalism of Sugar Blue, but he has also immersed himself in the postwar Chicago heritage. "Junior Wells is my main influence," he affirms. "I love Little Walter. both Sonny Boy Williamsons, Snooky Pryor. Slim Harpo, all that stuff." In that spirit, Omar combines ideas drawn from roots men like Wells with a propulsive, rhythmically diverse modernism patterned after the legendary "folk-funk" maestro, Bobby Rush, whom he first encountered via records his grandmother used to play around the house. As a vocalist, he casts an equally wide net. He admires deep-soul romanticists like Al Green along with grittier soul-blues singers such as Syl Johnson, Willie Clayton and the late Marvin Sease - but again, he refuses to be pigeonholed: "I love Junior Wells' singing," he reiterates, "I love Bobby Rush's singing. And I listen to a lot of church music - the Mighty Clouds of Joy, the Pilgrim Jubilees." Those Bobby Rush records his grandmother used to play did more than inspire him; they helped him cultivate the eclectic. genre-melding aesthetic that he now considers his calling card: "Bobby Rush, I was like. 'Damn - I love that dude, man!' He's one of the few guys who can actually do the soul music and the blues thing. He has the soul--tinged style. but at the same time, how can you not hear the blues in what he's doing? [And] Junior Wells, he made the connection. because he sang all that stuff - he was more like James Brown, but he played blues. So he made it work for the blues. It's all blues-based to me." It was years, though, before Omar finally took the plunge. "I only started playing harmonica when I was 25, 26," he affirms. "I used to be a barber, practicing harmonica in the barbershop. Deitra Farr was one of my customers, drummer Merle Perkins, a lot of blues folks; I remember Khalif 'Wallin" Walter, saying, 'Man, you should go to Buddy Guy's Legends; they have a jam on Mondays.' So I started seeking out the jams in the city. I used to love to go to Eddy Clearwater's place [the now-defunct Reservation Blues on Milwaukee Avenue] every Sunday. " It didn't take long for word to get out that an exciting new artist was on the scene - a versatile musician with a distinctive new school/old school vocal style, which he complemented with a harmonica sound rooted in tradition but updated with a contemporary rhythmic impetus and improvisational range. In 2005, he appeared on the Chicago Blues Festival as part of the "Chicago Blues Harmonica Project." a gig that coincided with a CD release of the same name. In 2011. he recorded his first CD under his own name, West Side Wiggle. 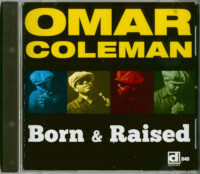 Born & Raised contains a healthy sampling of Omar's take on Bobby Rush's "folk-funk" style ("Sit Down Baby," "Man Like Me." "Lucky Man") as well as a tantalizing glimpse of a side of his musical persona that some of his admirers may have never heard: as a smoldering, urban contemporary "quiet storm" balladeer ("I Was A Fool"). It all adds up to a varied, crisply executed, and emotionally rewarding musical experience from an artist who insists on the freedom to define his music in his own way, even as he maintains his core identity as a bluesman. "If we all feel good about it,- he enthuses, "let's do it. People say, 'Man, you got the blues all up in there, but it's different: That's what I like to hear." 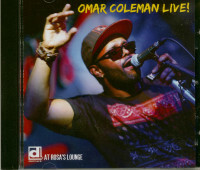 Customer evaluation for "Omar Coleman Live! (CD)"
Rocktimes 28.08.2016 "Omar Coleman hat eine prächtige Kapelle beisammen und spielt einen frischen, modernen Blues, der sich mit Nachdruck gegen die Genre übliche »My Baby Left Me«-Stimmung verwehrt. Omars Musik handelt nicht von Trübsal, sondern sprüht vor Lebensfreude. "